In the additional module for the reinforced concrete design of bars, no bars can be selected under the "basic information" in screen 1.1. Reinforced concrete bars are, however, modeled in the system. Where does the problem come from? 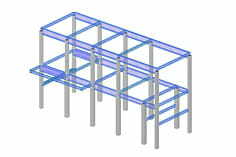 The selection of the bars in the additional module CONCRETE is not in the form 1.1, but in the form 1.6. There is a default "reinforcement set", to which all bars are assigned.